Amazon.com description: Product Description: Through the story of an ordinary man unwittingly drawn into a senseless murder on an Algerian beach, Camus explored what he termed "the nakedness of man faced with the absurd." First published in 1946; now in a new translation by Matthew Ward. About: (Book Jacket Status: Jacketed)Albert Camus’s spare, laconic masterpiece about a Frenchman who murders an Arab in Algeria is famous for having diagnosed, with a clarity almost scientific, that condition of reckless alienation and spiritual exhaustion that characterized so much of twentieth-century life. 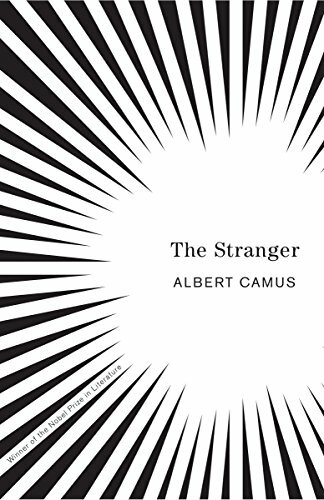 About: The Stranger Author: Albert Camus Publication date: published in 1942 The Stranger or The Outsider (French: LâÃtranger) is a novel by Albert Camus published in 1942. With Matthew Ward (other contributor) | from Alfred a Knopf Inc (March 1, 1988); titled "Stranger"
from Amereon Ltd (October 1, 1983); titled "Stranger"
About: With millions of copies sold The Stranger is one of the most widely read novels in the world. About: Through the story of an ordinary man unwittingly drawn into a senseless murder on an Algerian beach, Camus explored what he termed "the nakedness of man faced with the absurd.